Time to get back to normal, so to speak (or as normal as you can feel while trying to start wedding planning, it’s overwhelming, believe me). Are you ready for some new recipes after my fantastic cruise to the Caribbean? Me too. So I’ll start you off with an old favorite of mine. It doesn’t take much time to make, it’s a one pot meal and it’s perfect to make ahead and store in the refrigerator or even freeze, plus the yellow curry adds a nice kick. It’s my chicken, artichoke and curry casserole. Ever since getting back from the cruise, while I’ve still been concerned with eating healthy, I’ve also been concerned with making dishes that are quick and easy – I was getting burnt out spending so much time in the kitchen on weekends and weeknights trying to put things together. Life is just too short to spend hours in the kitchen, and it’s so much easier to make and transport a one pot meal to work too. That’s when Sean and I started trying to come up with more slow-cooker, one pot, casserole, etc. meals that we could make batches of to get us through the week, and I remembered this old gem. I’ve had this recipe since high school and made it a few times during college and beyond, but somehow or other I forgot about it until we were brainstorming. And really, it’s a breeze to make, especially when you have a leftover rotisserie chicken and a few staple canned veggies. 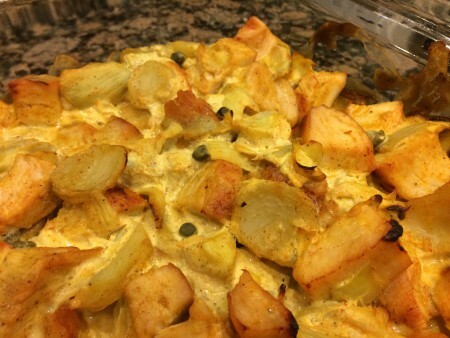 The original recipe calls for mayo and sour cream, but in order to make this chicken, artichoke and curry casserole healthy, I subbed in Greek yogurt instead. It’s such a versatile sub with good flavor and protein, but low in fat at the same time. Anyway, once the casserole is baked through, you can serve immediately or freeze individual servings for later – they thaw well in the microwave. Chop up the rotisserie chicken into bite-sized chunks. Then drain and quarter the artichoke hearts, and drain the water chestnuts, capers and mushrooms too. Place the chicken, artichoke hearts and mushrooms into a large mixing bowl. Mix the Greek yogurt with the corn starch (this will help it stay together and cook well in the oven). Add the Greek yogurt and curry powder to the large mixing bowl and stir it into the chicken and veggies until everything’s combined. Pour the contents of the bowl into a 9×13 casserole dish that’s been sprayed with nonstick spray. Sprinkle the slivered almonds on top and bake the whole thing in the oven for 30 – 35 minutes. The nuts should be toasted and the casserole bubbling when you remove it. Serve evenly among plates or divide up and save for lunches during the week. 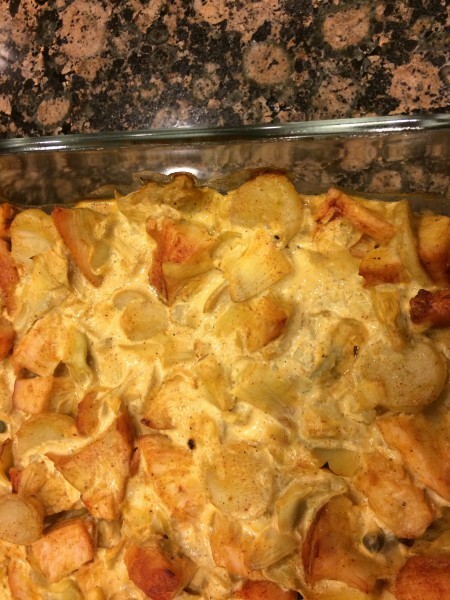 This entry was posted in Entrees, Recipes and tagged Artichoke, Casserole, Chicken, Chicken Artichoke Curry Casserole, Chicken Casserole, Chicken Curry, Chicken Curry Casserole, Curry, Entrees, Healthy, Low-fat, One Pot Meal, Recipes on March 11, 2015 by Paige N..